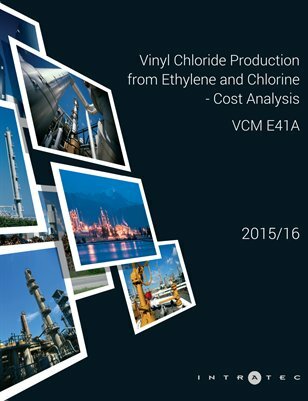 This report presents a cost analysis of Vinyl Chloride production from ethylene and chlorine via a balanced process. This typical balanced process combines two ethylene dichloride (EDC) production routes, direct chlorination and oxychlorination, for the production of Vinyl Chloride. By doing so, hydrogen chloride byproduct, produced in the thermal cracking unit, is used as raw material in the oxychlorination unit for additional production of EDC from ethylene. This study provides readers with key and hard-to-find information regarding a production process technology and its economics, such as a description of the manufacturing process and industrial site installations, plant construction cost breakdown, production cost breakdown, and raw materials consumption figures. It was developed according to a consistent methodology refined by Intratec Solutions over more than 12 years, which involves extensive bibliographic research and data gathering/validation, process simulations and robust cost models.